An elegant townhouse in London has been transformed into a temple of eco-conscious design and green living at London Design Festival 2015. 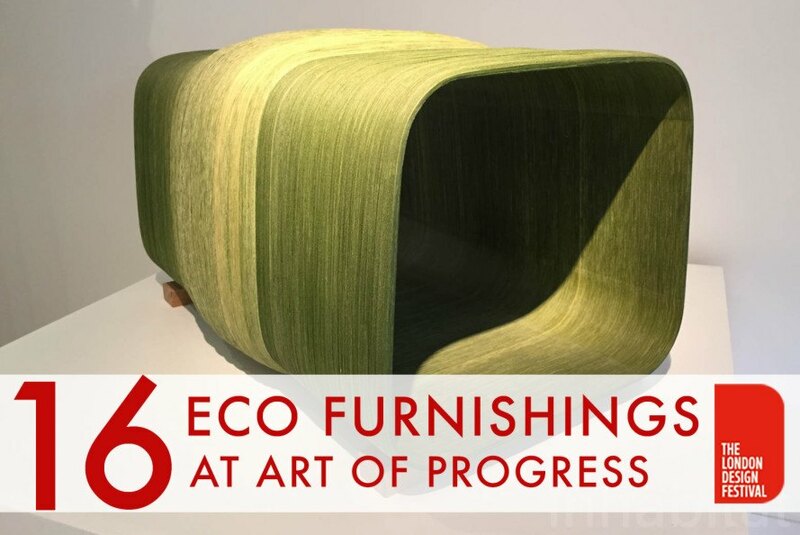 The five-story building at 19 Greek Street is currently showcasing The Art of Progress, an exhibit featuring upcycled furniture, earth-friendly fixtures, and sustainable accessories. The walls, covered with non-toxic paint, and surfaces are also decorated with environmentally friendly artwork from UK-based collective Human Nature. 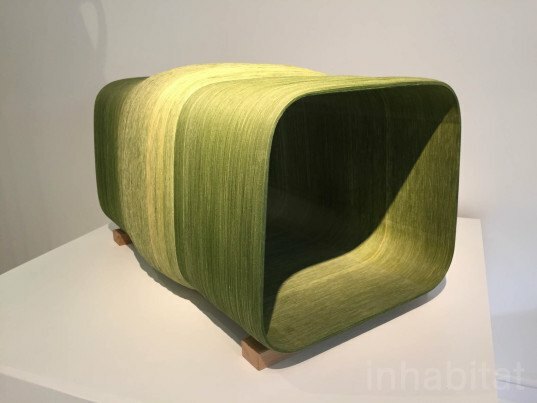 We’ve rounded up 16 inspiring green furnishings from the thought-provoking collection—read on to see them all! The 40 x 40 series by Moreno Ratti and Paolo Ulian experiments with the ubiquitous 40cm x 40cm marble tiles with a new twist. The artists used water-jet machines to cut the tiles with the objective of making tiles with minimal waste material. Caventou replaced the windows at 19 Greek Street with Current Windows for The Art of Progress project. 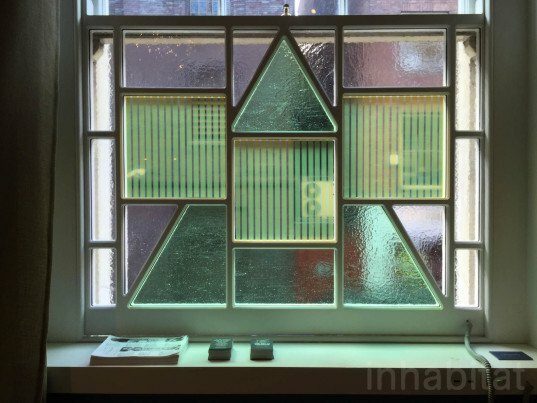 These “stained glass” windows are integrated with solar cells to generate renewable energy. London designers James Shaw and Marjan Van Aubel designed the Current Windows and added USB outlets into the window frame for easy access to solar powered charging. 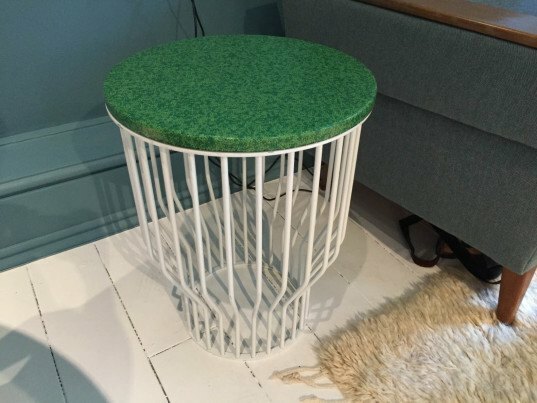 The wild pattern of the Crazy Marm side table by James Shaw comes from a veneer of upcycled linoleum found in a flooring factory. Traditional linoleum is made from wood flour and linseed oil. Why expend energy and cost to transport a heavy base for a lamp when a yam or similarly heavy vegetable will do? Peter Marigold’s vegetable light champions the sculptural and functional properties of vegetables as well as their edible functions. 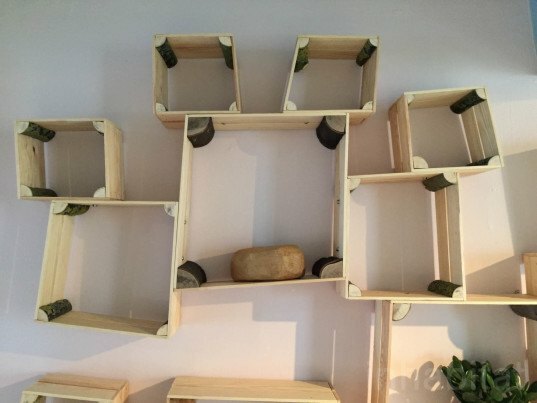 Split Box by Peter Marigold starts with a single small log, split into four pieces. Taking cues from nature, the unequal pieces determine the angle of the wooden box corners, resulting in off-kilter, but still useful storage. The side tables by Muzzle are made from Doka, a prefabricated formwork usually used in concrete pouring. The flat-packed pieces can be easily transported and quickly assembled. 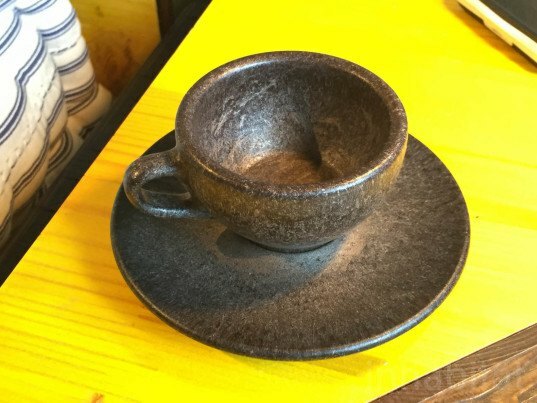 Yes, you can drink your coffee from a cup and saucer made from coffee! Designer Julian Lechner invented Kaffeeform, a material made from recycled coffee grounds and renewable raw materials. The coffee cup and saucer are washable and reusable. The surface of the Beads Table by Studio deFORM looks simple, but is surprisingly made of hundreds of readily available glass beads from the Czech Republic. 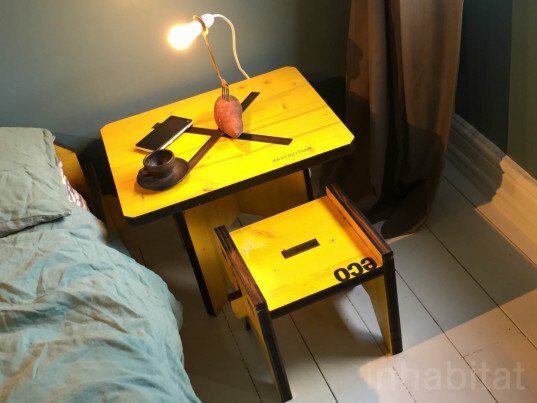 The A320 Leading-Edge Floor Lamp by Fallen Furniture has a shade made from reclaimed aircraft parts. The former section of an Airbus A320’s leading edge slat was highly sanded, polished and powder-coated for a reflective, Art Deco-inspired look. The Idea of a Tree bench by Austrian design duo mischler’traxler is made from colored recycled cotton, glue and resin, in a process powered by solar energy. The shape and size of the finished pieces are determined by the amount of sunlight in a day. The Day-by-Day rug designed by Austrian duo of mischer’traxler for Nodus makes evident the human labor that goes into making hand-knotted rugs. The shape and pattern of the naturally dyed wool rug is affected by the working rhythm of the craftsmen. 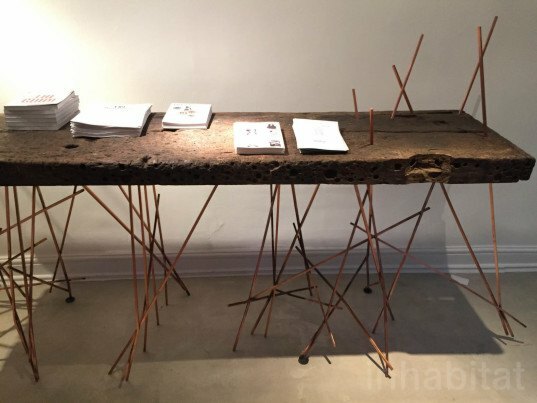 Belgian designer Lionel Jadot debuted his furniture collection at The Art of Progress, including this console table made of reclaimed wood, pierced by thin copper tubes. 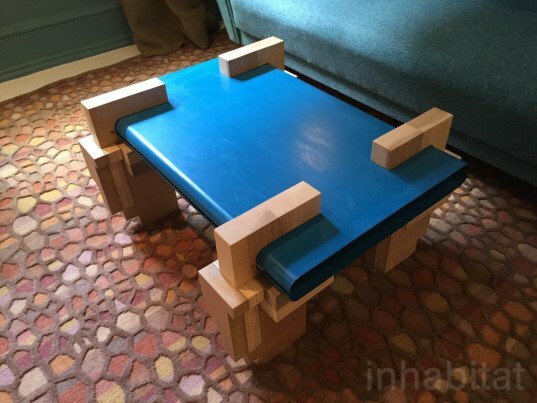 Belgian designer Lionel Jadot’s coffee table boasts a top made from part of a reclaimed ceiling and a frame made from FSC-certified wood. 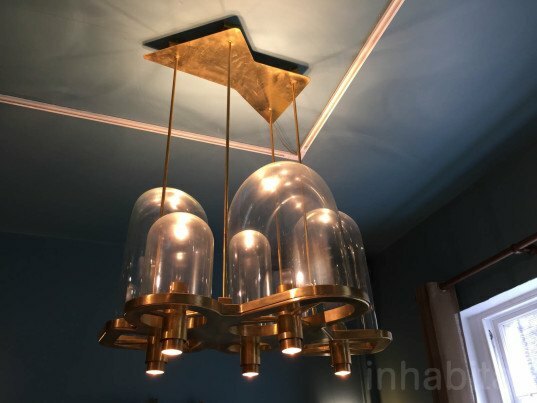 The Bell Lamp by Lionel Jadot is a glamorous take on upcycling, made from a restored 19th-century brass frame and glass globes. Lesley Hilling’s wooden sculptures, shown as part of the Human Nature environmentally conscious art exhibition, are made from salvaged wood, reclaimed floorboards and rescued furniture. Artist Ben Wilson paints intricate scenes on discarded chewing gum. The gum canvas is primed by first heating it with a blowtorch, then lacquered before being painted, with some pieces taking up to 10 hours. 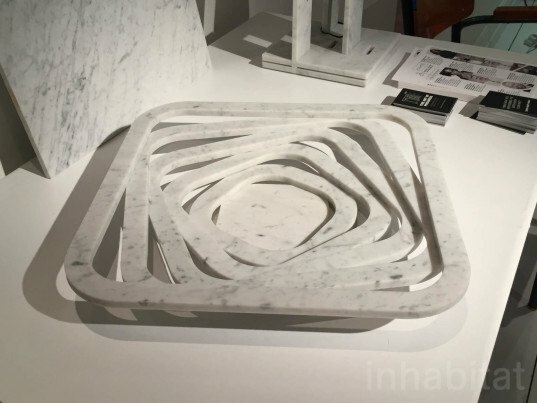 40 x 40 series in marble by Moreno Ratti and Paolo Ulian The 40 x 40 series by Moreno Ratti and Paolo Ulian experiments with the ubiquitous 40cm x 40cm marble tiles with a new twist. The artists used water-jet machines to cut the tiles with the objective of making tiles with minimal waste material. Solar Cell Current Windows by James Shaw and Marjan Van Aubel Caventou replaced the windows at 19 Greek Street with Current Windows for The Art of Progress project. These "stained glass" windows are integrated with solar cells to generate renewable energy. London designers James Shaw and Marjan Van Aubel designed the Current Windows and added USB outlets into the window frame for easy access to solar powered charging. Caventou replaced the windows at 19 Greek Street with Current Windows for The Art of Progress project. These "stained glass" windows are integrated with solar cells to generate renewable energy. London designers James Shaw and Marjan Van Aubel designed the Current Windows and added USB outlets into the window frame for easy access to solar powered charging. 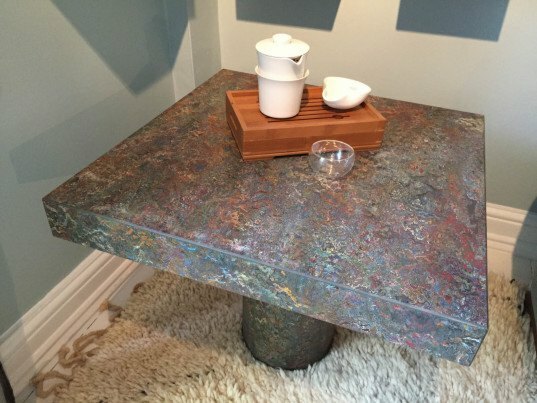 Crazy Marm table by James Shaw The wild pattern of the Crazy Marm side table by James Shaw comes from a veneer of upcycled linoleum found in a flooring factory. Traditional linoleum is made from wood flour and linseed oil. 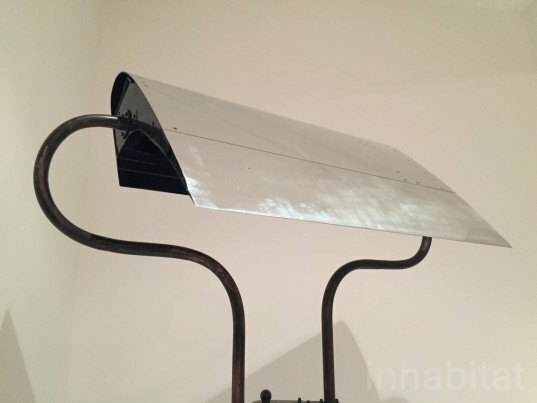 Vegetable Light by Peter Marigold Why expend energy and cost to transport a heavy base for a lamp when a yam or similarly heavy vegetable will do? Peter Marigold's vegetable light champions the sculptural and functional properties of vegetables as well as their edible functions. 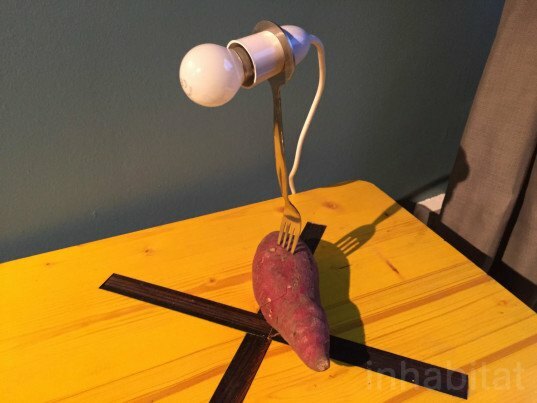 Why expend energy and cost to transport a heavy base for a lamp when a yam or similarly heavy vegetable will do? Peter Marigold's vegetable light champions the sculptural and functional properties of vegetables as well as their edible functions. Split Shelves by Peter Marigold Each irregular Split Box by Peter Marigold starts with a single small log, split into four pieces. Taking cues from nature, the unequal pieces determine the angle of the wooden box corners, resulting in off-kilter, but still useful storage. Each irregular Split Box by Peter Marigold starts with a single small log, split into four pieces. Taking cues from nature, the unequal pieces determine the angle of the wooden box corners, resulting in off-kilter, but still useful storage. Doka tables by Muzzle The side tables by Muzzle are made from Doka, a prefabricated formwork usually used in concrete pouring. The flat-packed pieces can be easily transported and quickly assembled. Kaffeeform by Julian Lechner Yes, you can drink your coffee from a cup and saucer made from coffee! Designer Julian Lechner invented Kaffeeform, a material made from recycled coffee grounds and renewable raw materials. The coffee cup and saucer are washable and reusable. Beads Table by Studio deFORM The surface of the Beads Table by Studio deFORM looks simple, but is surprisingly made of hundreds of readily available glass beads from the Czech Republic. Aircraft Lamp by Fallen Furniture The A320 Leading-Edge Floor Lamp by Fallen Furniture has a shade made from reclaimed aircraft parts. The former section of an Airbus A320’s leading edge slat was highly sanded, polished and powder-coated for a reflective, Art Deco-inspired look. Idea of a Tree bench by mischler'traxler The Idea of a Tree bench by Austrian design duo mischler'traxler is made from colored recycled cotton, glue and resin, in a process powered by solar energy. The shape and size of the finished pieces are determined by the amount of sunlight in a day. The Idea of a Tree bench by Austrian design duo mischler'traxler is made from colored recycled cotton, glue and resin, in a process powered by solar energy. The shape and size of the finished pieces are determined by the amount of sunlight in a day. 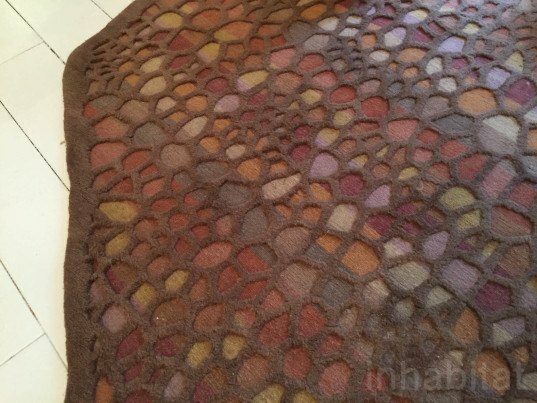 Day-by-Day rug by mischer traxler The Day-by-Day rug designed by Austrian duo of mischer'traxler for Nodus makes evident the human labor that goes into making hand-knotted rugs. The shape and pattern of the naturally dyed wool rug is affected by the working rhythm of the craftsmen. The Day-by-Day rug designed by Austrian duo of mischer'traxler for Nodus makes evident the human labor that goes into making hand-knotted rugs. The shape and pattern of the naturally dyed wool rug is affected by the working rhythm of the craftsmen. Console Table by Lionel Jadot Belgian designer Lionel Jadot debuted his furniture collection at The Art of Progress, including this console table made of reclaimed wood, pierced by thin copper tubes. Low Table by Lionel Jadot Belgian designer Lionel Jadot's coffee table boasts a top made from part of a reclaimed ceiling and a frame made from FSC-certified wood. Belgian designer Lionel Jadot's coffee table boasts a top made from part of a reclaimed ceiling and a frame made from FSC-certified wood. Bell Lamp by Lionel Jadot The Bell Lamp by Lionel Jadot is a glamorous take on upcycling, made from a restored 19th-century brass frame and glass globes. Wood Sculpture by Lesley Hilling Lesley Hilling's wooden sculptures, shown as part of the Human Nature environmentally conscious art exhibition, are made from salvaged wood, reclaimed floorboards and rescued furniture. 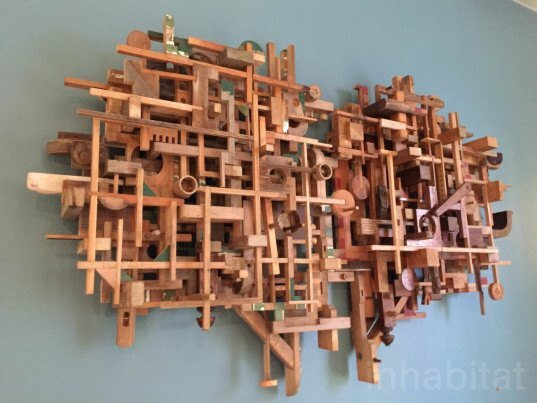 Lesley Hilling's wooden sculptures, shown as part of the Human Nature environmentally conscious art exhibition, are made from salvaged wood, reclaimed floorboards and rescued furniture. 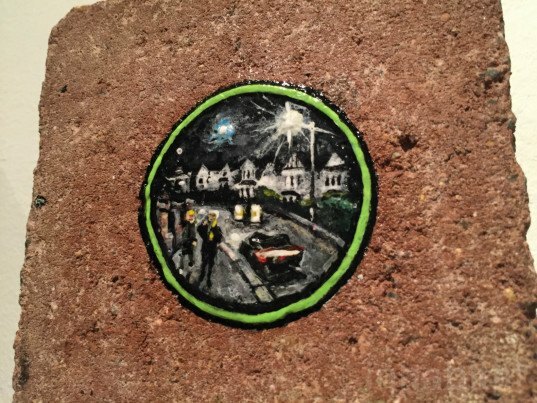 Chewing Gum Art by Ben Wilson Artist Ben Wilson paints intricate scenes on discarded chewing gum. The gum canvas is primed by first heating it with a blowtorch, then lacquered before being painted, with some pieces taking up to 10 hours. Virtual Reality by Human Nature Visitors at The Art of Progress can experience the 360-degree Virtual Reality film Natural Reality 2:1. Supported by eco-investment platform Abundance and directed by Third Channel, the film was commissioned and co-produced by Human Nature. The film explores the human connection to the digital world and "reality." 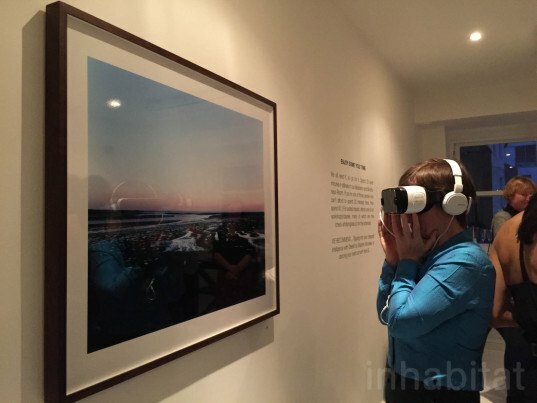 Visitors at The Art of Progress can experience the 360-degree Virtual Reality film Natural Reality 2:1. Supported by eco-investment platform Abundance and directed by Third Channel, the film was commissioned and co-produced by Human Nature. The film explores the human connection to the digital world and "reality."